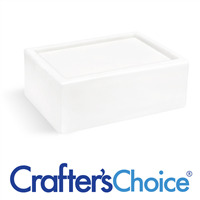 Crafter’s Choice White Melt and Pour Glycerin Soap Bases are popular for soapmaking because of their bright white color. Color additives will turn these soap bases to pastel colors. They are available in Basic, Detergent Free, and Premium, and are made in the USA. These are low sweat soap bases.